Relax, rejuvenate and reinforce nature's own action with this nourishing gel. Has both instant and long-term lifting actions. Enriched with vegetable-based protein extract, vitamins and minerals, this flash-firming gel not only produces visibly smoother skin but cumulative benefits against sagging, slackness and creping. Antioxidants including wheatgerm oil and vitamin E provide added softness while sun filters screen out sun damage. Apply morning and night from the chin to the décolleté to maximise results. This product comes in a squeezable tube when full sized or travel sized. It has an amber coloured, gel consistency, which is easy to apply from the fine opening. The product has anti ageing properties and a lightly floral fragrance. After application the skin feels well moisturised, however I didn't notice any difference in the appearance of the skin in the decollete area after using 15ml travel sized quantity, but perhaps a longer period is required. None really except if you are expecting a rich oily products that takes and age to sink in! I apply a marrowfat pea sized amount of this serum to my neck and decolletage nightly after warming it in my hands first. It goes on easily and is great for smoothing out the fine lines. Never Mind The Expense...It Works!! Gatinueau products are always high performance and each product is scientifically tested to ensure maximum results. I have been using this neck serum for many years on and off since my late twenties. 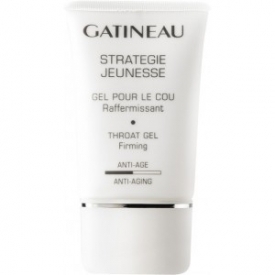 Back then I was not showing any signs of ageing around my neck and décolleté area however I wanted to keep the ageing at bay and with this product I have managed it. The serum is lightweight in formula and a honey yellow colour. The scent is hard to describe but it is a cross between, floral and herbal but none the less very pleasant. The serum is housed in a simple and practical soft squeeze tube with narrow nozzle to prevent over use of product. I only need a 5p worth size of product for my neck and décolleté which I massage upwards in long strokes beginning from the chest area. With this serum you see dramatic and instant results! The skin looks deeply hydrated and creepiness and fin lines are instantly smoothed. You can feel an immediate tightening and toning of the skin that lasts all day after application. There is no stickiness or residue from the product. I have always applied this twice daily and at a few months shy of 40 my neck and décolleté still look young and toned. Even if you have no visible signs of ageing in these areas at present I would highly recommend the purchase as for me this serum has done a remarkable job of holding back the years! If you think it is already too late for you this product will take years off you.